Five decks of cards, eight engaging games, and 15 reasons for playing them. One, Two, Three, … Clap! The most important leadership secret. Playing (and learning) around the world. Share a piece of practical advice. After 14 years of field-testing and continuous improvement, we have a new card game system ready for use. We are working on other key training topics. These decks will be available soon. Each deck contains 52 practical advice cards (plus a couple of Jokers). Building Trust: Admit your mistakes as soon as you become aware of them. Coaching for Performance: At the end of the coaching session, ask your employee to summarize the problem, the solution, and the action steps. Customer Service: Actively listen to the customer's questions and concerns. Repeat back to establish that you have clearly understood the situation. Listening Skills: Avoid multitasking. Don't check your email, send text messages, read a book, surf the Internet, or watch the TV. Close the book and turn off all electronic devices. Motivation Techniques: Allow team members to make maximum use of their strengths and talents. You can read each piece of advice as if it were a tip for the day. To go beyond passive reading, we have designed several training games to entice people to discuss, evaluate, and apply the suggestions from these cards. These games can be played by different numbers of players (ranging from 1 to 100), and last for different periods of time (from 10 minutes to 52 weeks). Chat. 3 to 50 players, 12 to 30 minutes. Objective: Discuss a piece of advice from different perspectives. Thirty-Five. 6 to 100 players, 20 to 30 minutes. Objective: Identify the most useful pieces of advice. Triads. 3 to 102 players, 15 to 30 minutes. Objective: Improve the positive outcomes (and reduce the negative outcomes) of implementing a piece of advice. Explain and Decide. 9 to 100 players, 20 to 40 minutes. Objective: Compare different pieces of advice and select the most useful one. Suits. 4 to 100 players, 20 to 30 minutes. Objective: Select the best pieces of advice. Mingle and Market. 12 to 100 players, 20 to 30 minutes. Objective: Review, compare, and evaluate pieces of practical advice. Triple Filter. 1 to 100 players, 10 to 15 minutes. Objective: Select pieces of advice that can be easily implemented in a variety of situations to produce high impact outcomes. One a Week. 1 to 100 players, 20 to 30 minutes each day of the week for 52 weeks. Objective: To enhance the implementation of each practical piece of advice. We are designing and field-testing more training games that use practical advice cards. You can access complete instructions for these games from our web site. Solid, valid content. We did not make up the pieces of advice off the top of our head. Instead, we reviewed several books and training packages and selected the most useful pieces of advice on each training topic. We also talked to subject-matter experts and practitioners in the field. The pieces of advice are based on empirical evidence. Variety of topics. The decks of cards deal with key competencies related to popular corporate training sessions: building trust, coaching for performance, customer service, listening skills, and motivation techniques. We are continuing our needs analysis and collecting of validated pieces of advice on additional topics such as presentation skills, giving and getting feedback, and working globally. Open approach. The pieces of advice are not limited to a specific book or a proprietary model that deals with the topic. Instead, these tips leverage what the players may have learned from a variety of books they read, training sessions they attended, and experiences they have accumulated. The games encourage mutual learning from a diverse group of players. Practical nature. All pieces of advice involve specific actionable ideas. They are not abstract theoretical constructs or philosophical principles. Self-contained ideas. The piece of advice on each card can be immediately implemented to produce measurable results. You don't have to master a comprehensive conceptual framework or a lengthy step-by-step procedure to achieve the desirable outcomes. Variety of games. You can play several different training games that incorporate the same deck of practical advice cards. Field-tested content and activities. We have been working on the content on the cards and the activities in the training games for the past 14 years. We have tried out and improved all components of this system in several workshops around the world. Comprehensive processing. The key activities in the training games require the players to examine each piece of advice from different angles. The players discuss, analyze, compare, evaluate, arrange, select, apply, and modify the pieces of advice. They also figure out the costs and benefits of implementing the piece of advice and discover how to reduce the disadvantages and increase the advantages. Any number can play. The set of practical advice card games can accommodate different numbers of players from 1 to 100+. The games can be used in individual coaching to large group planning sessions. From rapid to reflective. The time required for the play of these games ranges from 10 minutes to 52 weeks. You can select the best game to suit your schedule. Player friendly. All practical advice card games have been repeatedly play-tested with groups of players around the world. They have been continuously revised to improve their relevance, flexibility, simplicity, efficiency, and intellectual stimulation. Facilitator friendly. The facilitators' manual is designed for effective use by the trainer. Each game is described in a step-by-step fashion using our structured text approach that clearly specifies the purpose of the game, number of participants, time requirements, supplies, room set up, and preparation. Companion website. We have established a website with updates and enhancements of the practical advice card games. This web site contains lists of recommended books, instructions for new games, modifications and variations of the existing games, and tips for facilitators. Same game, different content. 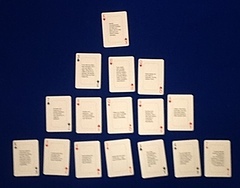 Once you learn how to conduct any of the games with cards that deal with a specific topic (such as motivation techniques), you will discover that the same game can be used with practical advice cards that deal with other topics. From the player's point of view, they leverage learning the game to learning from the game. Reinforced by another deck of cards. Each topic in the practical advice decks has a companion deck of cards (sold separately) with an entirely different type of content and with different play activities. You can use these decks (called Four Suits ) to strengthen the impact of the Practical Advice Card decks. This activity requires a team to rate the usefulness of different pieces of practical advice. It also serves another purpose: Based on their experience in the activity, the participants learn how to communicate effectively and to provide equal opportunity to all team members. Teams of participants classify 16 practical advice cards into seven categories related to the usefulness of the advice. Later, they reflect on the effectiveness of their joint decisionmaking and plan for better communication. They implement this plan by sorting another set of 16 cards. To work as a team and sort a set of practical advice cards into seven categories related to the usefulness of each piece of advice. Organize teams. Divide the participants into two or more teams of three to seven members each. Distribute practical advice cards. Deal 16 practical advice cards, one card at a time to each team member. Some participants may receive one more card than the others. Extremely useless. Participants must choose the single card that is the most useless. Useless. Participants must choose two cards that are useless. Somewhat useless. Participants must choose three cards that are slightly useless. Neutral. Participants must choose four cards that are neither useless nor useful. Somewhat useful. Participants must choose three cards that are slightly useful. Useful. Participants must choose two cards that are useful. Most useful. Participants must choose the single most useful card. Sort the cards. Ask the participants to set up space for the seven categories. Tell them to take turns to read one card at a time, discuss it, and place it on the appropriate category. Encourage the participants to rearrange the cards as more items are added to the continuum. Announce a 15-minute time limit for completing the task. Conclude the task. At the end of 15 minutes, ask the teams to stop classifying the cards. Reassure them that it does not matter if the task is not completed. Are you happy with the way the cards have been classified into the seven categories? How satisfied are you with the final results? Do you think the team's collaborative decisions are superior to decisions that you could have made alone? Why do you think so? During the card classification activity, did your teammates listen to your ideas? Did you have sufficient opportunity to share your ideas? Do you feel that everyone was given equal opportunity to participate in the classification process? Do you think that some people have more expertise about the topic? Should they have been given more time than the others? Do you feel that some people have more expertise in facilitating group activities? Should they have been given a leadership role? Do you feel that some people have communication difficulties? How could we support these people? Could you have performed the card-sorting task more effectively if you used a systematic procedure? What steps should this procedure contain? People differ in their thinking styles and communication styles. How did these differences manifest themselves in your teamwork? Brief the teams. Inform the teams that you are going to give them another set of 16 cards. They have to repeat the process of classifying this new set of cards into the same seven categories reflecting their usefulness. Ask the teams to plan. Based on their previous experience and on the debriefing discussion, ask the team members to come up with a suitable procedure. Explain that their goal is to complete the classification task efficiently and to give all participants equal opportunity to share their ideas. Announce a time limit of 5 minutes to plan an appropriate procedure. Begin the second round. Distribute 16 cards, one card at a time to each participant as before. Announce a time limit of 15 minutes and ask the teams to get started. How satisfied are you with the results of this round? Are you more satisfied with the second round than with the first one? Why do you feel that way? Are you happier this time about the opportunities for equal participation? Did the planning before the activity help you become more effective? What were the major differences between the procedures used during this round and the earlier round? Could we make the procedure better? Is there a limit to how many times we can improve the procedure? Could we ever achieve an ideal procedure that will satisfy everyone's needs? Here's a slightly modified version of Tracy's jolt, Do You See What I See? , published in the April 2011 issue of TGL . This version is inspired by puzzles that display extreme close-up photographs and require you to guess what the object is. The jolt explores the concept of getting too close to something both literally and metaphorically. Participants make a circle with their right thumb and index finger. They note what are able to see through this circle when they are close to an object and away from it. To explore how looking at an object from a distance helps us see a wider picture. One or more, working independently. Best results are obtained with groups of more than 10. Rehearse the activity. Follow the instructions give below to experience what the participants will be doing and seeing. Extend your left hand with palm open, facing up. Make a circle with your right thumb and index finger. Place this circle on top of the left open palm. Look through the circle and note what you see. Keep your left hand stretched out. Keep looking through the circle that you created with your right thumb and index finger. Move this circle away from your left palm toward your eyes. Make a note of what you can see as you bring the circle close to your right eye. Comment on what can be seen through the circle. Ask the participants to move their thumb-index finger circle close to the left palm and away from it. Point out that they are able to see the entire palm and parts of the left hand as they move away from the palm. When the circle gets closer to the palm, they are able to see only a small part. Explain the key learning point: When we get too close to an object, we see only parts of it. Judging from what we see, sometime we many not even be able to figure out the true nature of the object. When we move away from the object, we see the entire object in context. It becomes more meaningful. Ask the participants for real-world examples. Encourage them to talk about situations where getting too close to an object conceals the broader context. Discuss metaphorical equivalents. Invite the participants to talk about how looking at objects, people, and events from a psychological distance enables us to see the bigger picture. Getting too close to an object prevents us from seeing the total picture. Looking at things from a distance provides us with the context and additional insights. We are producing a series of video jolts and hope to release them in upcoming issues of TGL . This issue's jolt lasts for 2 minutes and 22 seconds. Visit http://bit.ly/PFD7A9 to watch Thiagi demonstrating one of his favorite jolts. Watch the video and master the mechanics of the jolt. Modify the jolt to suit your personal style and use it with your participants to drive home your learning point. During the next few months Thiagi will be piling up frequent flyer miles traveling to different parts of Europe and Asia, conducting his 3-day interactive training strategies workshop. Here's an update of our international workshops. For additional information, brochures, and registration forms, visit our website calendar. Interactive Strategies for Training and Education ( Stratégies interactives pour la formation et l'enseignement ). Organized by Bruno Hourst and his team at Mieux Apprendre. In English with simultaneous translation. Techniques interactives de formation: les outils fondamentaux . Présenté par Thiagi, Bruno Hourst et Patrick Dorpmund. Participants and Presenters: Better Together . Preconference workshop at the Canadian Association of Professional Speakers National Convention 2012. Interactive Strategies for Improving Performance—All New! . Interactive Training Strategies . Organized by Stanis Benjamin and his team at Centre for Communication and Sales Training. Interactive Training Strategies . Organized by Click Academy Asia. Interactive Training Strategies, Switzerland . Organized by Samuel van den Bergh and his team at van den Bergh Thiagi Associates. Design Clinic and Advance Interactive Strategies, Switzerland . Presented by Thiagi and Samuel van den Bergh. Organized by Samuel van den Bergh and his team at van den Bergh Thiagi Associates. We are in the final stages of organizing our workshops in Australia and India. Successful group facilitation depends as much on attitude as technique. Plenty of books give a variety of strategies to keep a group engaged and focused. But resources for honing the internal attitudes helpful for effective facilitation are not as common. This issue of the Firefly News Flash features a deck of cards that will challenge anyone to consider the best attitudes for balanced, impartial facilitation. Power Tip: Distribute facilitation roles among all participants for a harmonious group. Read more in the October 2012 issue of Firefly News Flash : http://www.thefirefly.org/Firefly/html/News%20Flash/2012/October%202012.htm . Many of my friends conduct training sessions on behavioral interviewing. You are probably familiar with this technique. This issue's survey is related to behavioral interviewing. What practical advice do you have for a manager who is planning to conduct a behavioral interview? PsyBlog is a website about scientific research into how the mind works. It's written, designed, and coded by Jeremy Dean, who is a researcher at University College London working towards a PhD. Jeremy translates articles published in reputable academic journals into readable and practical prose. There are five free and easy ways to follow website updates at http://www.spring.org.uk/get-the-latest-from-psyblog . I use PsyBlog's Twitter feed. The website archives back issues of the blog since 2004. It also contains a list of popular articles and a convenient search engine.